STOKES COUNTY, N.C. (WGHP) -- A picture belonging to a family in the Yadkin County community of Courtney was found 35 miles away north of Sauratown Mountain after Wednesday's tornado. "I looked up and here is the piece of paper floating down," said Jimmy Beasley, who found the photo of a young girl after the storm passed Wednesday. "It landed within 10 feet of a weeping willow." Beasley wanted to find who the photograph belonged to so he shared it on his Facebook page. The image was re-shared hundreds of time. 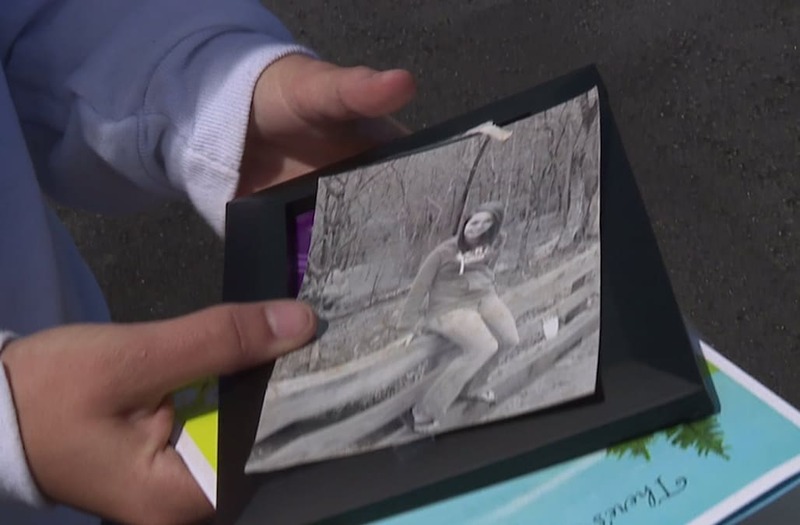 FOX8's Chad Tucker shared it on his page and a few hours later Ashley Baity messaged him to say the young woman in the picture was her, taken when she was in eighth grade at Stone Mountain State Park. The image came from Baity's mother's home in Courtney, which was destroyed by the tornado, 35 miles away. "I think it's crazy that it ended up so far," said Baity, who met Beasley Thursday morning. "The photo came from my mom's home that is just completely flat from the tornado." Beasley meet Baity with the photograph, a card and a new frame for her mom, who survived the storm with lacerations. "I think that it was a higher power," Baity said. "God telling us that it was all going to be OK and that we are going to pick up the pieces."